The latest sports stadium swindle is going down in Chicago, and the anger is both palpable and widespread. My kids are into Angry Birds, a game they love for the same reason I once obsessively played Super Mario Brothers: its appeal is incomprehensible to the adults around them. This inscrutable game, however, has one essential truth: you have some pissed off birds compelled by rage to put down some zombie-looking pigs. After a sad effort to play the game myself, I had my own epiphany: this game is actually a metaphor for the city of Chicago. Please bear with me. Angry Birds is more Chicago than the Sears Tower, Wrigley Field or deep-dish pizza. The lunacy, the violence, the plethora of increasingly crazed pigs and those fierce feathered fowl all represent the political actors in a city that’s gone over the edge. 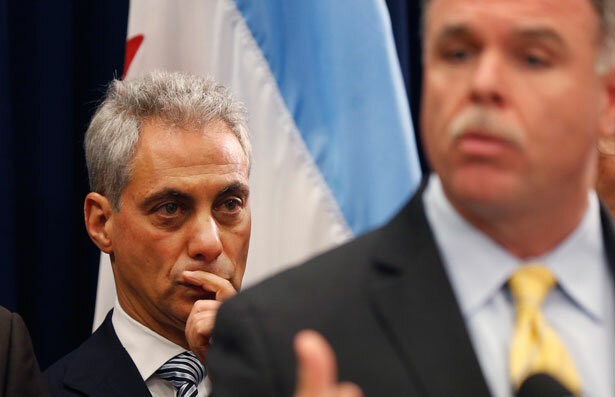 It all starts with the person who seems committed to win the current spirited competition as the most loathsome person in American political life: Mayor Rahm Emanuel. The same Mayor overseeing the closing of fifty-four schools and six community mental health clinics under the justification of a “budgetary crisis” has announced that the city will be handing over more than $100 million to DePaul University for a new basketball arena. This is part of a mammoth redevelopment project on South Lakeshore Drive consisting of a convention center anchored by an arena for a non-descript basketball team that has gone 47-111 over the last five years. It’s also miles away from DePaul’s campus. These aren’t the actions of a mayor. They’re the actions of a mad king. The fact that Rick Telander wrote these words matters. The wine is out of the bottle and the horse is out of the barn. In 2013, it’s no longer a few of us cap-wearing Cassandras shouting that the end is nigh if we keep hollowing city budgets to pay for these monuments to corporate welfare. It’s Rick Telander. It’s the Chicago Sun-Times sports page. It’s all of us. I’ve seen dumber things than a mayor offering to spend $173 million in tax money on a building for a private college that already has its pick of several arenas to play in—but not much dumber…. I can’t for the life of me imagine what Emanuel thinks Chicago is likely to get out of this deal, unless he really thinks that convention planners are just waiting for a 12,000-seat arena to hold their plenary sessions in, at which point they’ll start throwing wadded-up hundred-dollar bills at any Chicagoan they can find. DeMause is right. The only explanation for this is that Rahm is scratching someone’s back in the DePaul Catholic hierarchy of Chicago. This is power politics the likes of which Chicago has honed into a crude, low art form, with the myriad public officials behind bars to prove it. In this case, the hottest rumor is that approval of legalized gambling is on the horizon and the convention center’s locale will be its epicenter. The arena is, in effect, a Trojan Horse for a casino. If true, Chicagoans should shudder. Even better, they should take a field trip four hours east to Detroit. The Motor City has gambling, and I’ve been to their casinos. If you ever want to see exhausted families spend their last dollars in hopes to make enough to last the month, go to a Detroit casino. That’s the future Rahm Emanuel dreams about for the working people of Chicago. The difference now is that the pigs aren’t feeding at an overflowing trough. They’re feeding on the last grizzled meat sticking to our bones. There’s simply not enough slop to go around and people are fed up with being fed upon. I have nothing against basketball and nothing against DePaul. But Rahm Emanuel and his upside-down priorities disgust me. In a deeply segregated city like Chicago, the gun violence that’s been all over the national news is the result of systematically tearing apart communities. Gentrification is not the answer for this city. The answer is decent jobs, social services, quality affordable housing, access to health care and fully funded schools, not another round of corporate welfare. Rahm may have an army of zombie pigs who know how to do nothing but feed, but each and every neighborhood facing violence, school closures, clinic closures and public graft has a slew of increasingly angry birds. The people are long done playing Rahm’s game. Who’s bankrolling the Center for American Progress, and what are they getting in return? Read Ken Silverstein’s report.